In the 20th century new technologies—acoustic probes, satellite surveillance, remotely operated vehicles and sensors, lasers, innovative diving systems, a scattering of manned submersibles and other modern research tools—made possible unprecedented maritime discoveries. As a consequence, more has been learned about the ocean in recent decades than during all preceding human history. That knowledge emphasizes how critical the ocean is to life on Earth. It is information vital to understanding human survival and well-being—ocean literacy is necessary so that we can make the most of our lives and our environment. Of all the great discoveries about the sea, the two most significant may be, first, that life on Earth—including our own—is dependent on the existence of the ocean. The second major discovery is that the ocean does not have an infinite capacity to absorb without harm the wastes we allow to flow in to it, nor can it fully recover from the millions of tons of wildlife that we extract from it. In short, we have the capacity to alter the nature of the ocean and thus affect the basic processes that make Earth hospitable for life as we know it. This knowledge alone is reason enough to ensure that our children become ocean literate. We know that the ocean contains 97 percent of Earth’s water and that it yields vapor to the atmosphere that eventually returns as fresh water in the form of rain, sleet, or snow. We understand that the living ocean shapes climate and weather, stabilizes temperature, governs planetary chemistry, comprises more than 97 percent of the biosphere —Earth’s living space—and generates more than 70 percent of the atmospheric oxygen. Estimates of the number of distinctive species of organisms in the ocean suggest a much richer and more diverse cauldron of life than had previously been supposed, with estimates ranging from 10 to 50 million or more as yet to be described; so far, all known land and aquatic organisms together total only about 1.5 million species. Through their influence on future generations teachers have special opportunities to shape the future of the ocean—and thus of humankind. It may take time for textbooks, curricula, and standard testing regimes to catch up with the needs of a swiftly changing world and incorporate recognition of the significance of the ocean to all people everywhere. 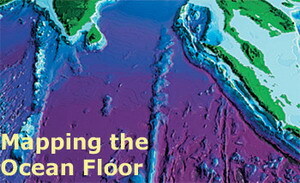 This conference aims to facilitate that process—to make teaching about the ocean easier. The ocean can not only fit within existing educational frameworks of math, science, geography, history, political science, social studies, economics, art, music, languages, sociology, religion, anthropology, engineering and other typical topics, but also permeates, saturates, and resonates through the very heart of human culture. Our knowledge of the ocean, much of it so recent, is as dynamic as the ocean itself. Numerous themes document how new that understanding is as well as how important it is to continue to study the ocean and act on our findings. In time past many maps of the world depicted the land in great detail, but showed the ocean only as big blobs of blue. That is changing rapidly as awareness and appreciation grow about the importance of the two thirds of the surface of the Earth that is covered by an average depth of two and a half miles of water. 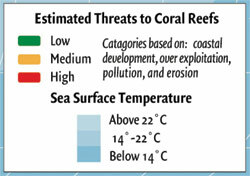 To understand the magnitude of the challenge now facing us concerning ocean exploration, charts are essential. Mapping the ocean might seem a straightforward task until you consider the complexities of working underwater, of dealing with three dimensional seascapes, of changing shorelines, tidal impacts, of currents—warm and cold, surface and deep—and more. Given the difficulties, it is amazing that it is now possible to envision Earth’s major mountain formations—40,000 miles of mountain ranges running down the length of the major ocean basins like giant backbones. Remarkable new acoustic technologies literally make it possible to “see” with sound, and thus chart thousands of peaks and valleys, hills and plains, even when they are covered by several miles of ocean. Even satellites are being employed to help map the ocean using precise technologies that detect the configuration of the seafloor from high in the sky. Precise navigation techniques coupled with good charts of the sea floor are transforming the way people think about the ocean. No longer an amorphous, formidable and unknowable realm. In the middle of the 20th century, people scoffed at the notion that continents might actually move around, despite the intriguing way that land masses seemed to be like giant puzzle pieces that could be assembled into a single land mass. Within two decades, evidence from the deep sea convinced scientists of the existence of mechanisms that have caused continents to drift and that the process continues at a stately geological pace. The Atlantic Ocean is now known to be young and growing at the rate of a few centimeters every year. 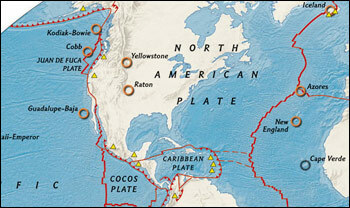 The Pacific is much older, and while still expanding from the middle, is getting smaller by a few centimeters every year as ocean crust is ground under continental margins, causing earthquakes and altering the face of the land in the process. Core samples from great ocean depths have yielded significant new insights, concerning not only the geological processes that shape the world, but also changes in climate over the ages and of variations in the assemblages of life in the sea. The discovery of hot springs—hydrothermal vents—in the deep sea proved to be a scientific bonanza, not only for geologists confirming suspicions about geological processes that had been predicted, but also for biologists. Life associated with hydrothermal vents in the deep sea revolutionized concepts about the origin of life and about the possibility that living systems similar to those associated with volcanic vents in the deep sea may prosper elsewhere in the universe. In the absence of light and green plants, microorganisms were found fixing carbon through chemosynthesis, and in the process fueling previously unknown ecosystems of diverse deep-sea organisms. In the 21st century people expect to be able to make short-range plans based on reasonably accurate predictions of the weather, and long-range commitments based on reasonably accurate predictions of the climate. Neither would be possible but for growing ability to assess the nature of ocean phenomena and correlate this knowledge with information gathered from numerous land-based weather stations. Satellites communicating with instruments on ocean buoys, together with data obtained by ships and deep-sea probes are gathering unprecedented knowledge about how the world works. Every few years around Christmas time, the characteristically cool, highly productive waters along the coast of Peru become significantly warmer, killing or driving away the great schools of small fish and other organisms that typically abound in the region. Called “El Nino”—the Christ child—because of its midwinter onset, the phenomenon eventually became recognized as something much more than a curious coastal event impacting Peru. Correlation of observations from space and data from hundreds of sea- and land-based stations showed El Nino to originate far to the west in the Pacific Ocean, with global influence. The ongoing interactions of ocean temperature, currents, and atmospheric conditions across the world were brought into better focus as a consequence of understanding how El Nino can yield flooding in the Midwestern United States, nudge drought conditions in Africa, alter the yield of corn and wheat and thus impact the price of various commodities. Is hasn’t taken long for scientists to recognize that El Nino is one of many cyclical ocean events that interact to yield the short and long range character of Earth’s environment. In fact, the most important impact of the El Nino phenomenon on human society may be the dawning of awareness of how closely connected our lives are to the sea, no matter where on the planet we live. Hundreds of thousands of shipwrecks, each a time capsule of history, rest on the bottom of the sea. Natural disasters such as earthquakes and the gradual process of sea level rise since the last ice age 15 thousand years ago have inundated coastal communities and ancient pathways. Locating and gaining access to most submerged treasures has awaited the development of technologies that make it possible for historians, archeologists, and others to effectively work underwater. Archeologist George Bass pioneered use of submersibles for discovery and documentation of ancient shipwrecks in the Mediterranean Sea and Black Sea in the 1950s, and he demonstrated that it is possible to apply the same careful techniques underwater that have been used to develop knowledge of human history on the land. In Florida, Alaska, the Black Sea and many other coastal areas, discoveries of human artifacts thousands of years old have been made far offshore in areas that once were dry land. 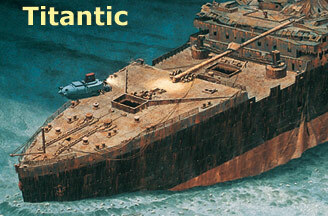 In 1983, discovery and subsequent careful documentation of the “unsinkable” British ocean liner, RMS Titanic two and a half miles under the North Atlantic Ocean revolutionized the way people think about what is “lost” in the ocean. The scientific and technological investments—and rewards—involved in finding and exploring the wreck of the Titanic quickly extended into historic, social, political, artistic and even economic dimensions as people worldwide became engrossed with the compelling story of the ship and the lives that were lost forever. Most important, perhaps, has been the awakening of new awareness of just how much of what matters to humankind relates to our love affair with the sea. And, what once was thought to be forever swallowed by the depths may yet—someday—be found. In clear tropical waters around the midsection of the Earth, coral reefs host a profusion of plants and animals that some liken to rain forests in terms of diversity and abundance. Although covering only about one percent of the ocean, coral reefs have special significance because of their legendary diversity, including about 25 percent of all known marine fish species. Hundreds of millions of years of fine-tuning have yielded closely knit systems that include representatives from nearly all of the more than 30 major divisions of animal life as well as most of the main categories of plants, bacteria, and microbes that embrace the spectrum of genetic diversity on the planet. Sponges, echinoderms, polychaete worms, mollusks, crustaceans and numerous other animal groups are not only enormously diverse in coral reef systems, but also have developed close interactions. Partnerships between microscopic algae and living corals are at the heart of the basic limestone structure of the reefs, coupled with certain red and green algae that precipitate calcium carbonate from the surrounding sea water to form their own limestone-enhanced cellular structures. Although vulnerable to storms, climate change and other natural events, coral reefs have thrived continuously in some areas for hundreds of thousands of years, while overall, coral reef systems have prospered through many millions of years of change. Of grave concern today is the swift decline worldwide of these durable, resilient, diverse systems in just a few decades. Estimates about the scope of loss vary, but a conservative estimate is that more than 25 percent of the reefs that thrived in the middle of the 20th century are gone or are “ghost cities” today, and at least another 25 percent show signs of significant deterioration. steady global warming trend appears to be stressing coral and other reef organisms making them less resilient, and generally more vulnerable to disease. Major problems stem from disruption of food webs through human predation on large herbivores. 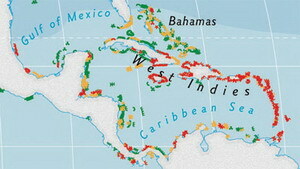 Land-based activities—agriculture, development, removal of forests—have released smothering sediments and toxins into the oceans and onto coral reefs. While many factors are involved in the precipitous decline of coral reefs, nearly all relate to a single source —humankind. In fact, coral reefs may prove to be most useful to us not for their recreational value, their role in buffering adjacent lands from severe storms, or for food or minerals or sources of amazingly effective new pharmaceuticals or even valuable new scientific insights about the origins and future of life. Rather, their most important role may be as a signal that we have the power to destroy the nature of the ocean, and conversely, that we also have the power to heal. Globally, coral reefs are inspiring people to take actions to protect the ocean in ways that mirror policies initiated years ago for national parks. With knowing comes caring, and with caring there is hope that we can find a reasonable balance, an enduring place for ourselves, with coral reefs, with the ocean, with the rest of life on Earth. The previous examples show that our increased knowledge allows us to improve our stewardship of the ocean, and thus enrich our own lives. The new millennium begins with few remotely operated vehicles or manned systems capable of accessing the average depth of the sea, two and a half miles. One of these, Woods Hole Oceanographic Institution’s deep-diving sub, Alvin, has logged more successful dives in more parts of the sea than any other submersible, but it is just one vehicle in an astonishingly small global fleet of deep systems. Only four manned submersibles in the world, none of them operated by the United States, are presently capable of descending to as much as half the ocean’s depth—and safely return to the surface. (Engineers are fond of pointing out that only round trips count). Our knowledge of the ocean is still limited. Led by organizations such as the National Geographic Society and NOAA, we must continue to learn about the ocean and its impact on our lives. And we must continue to impart that knowledge to our children—the hope and future of the ocean as well as our own civilization. As never before, we know how important the sea is to human survival and well-being; perhaps as never again, we have a chance to do what it takes to maintain the health of the vast blue realm that provides the foundation for life on Earth. Ocean literacy is a necessity so that we can take advantage of our great opportunity.